Agonis flexuosa Variegata in Clay? I am wanting to put in an agonis flexuosa and we are coastal on significantly heavy clay. Do you think it will do ok or should we go for something else? Will it survive or just be slower to grow? I would put in gypsum and compost etc on the hole to help. Thanks!!! 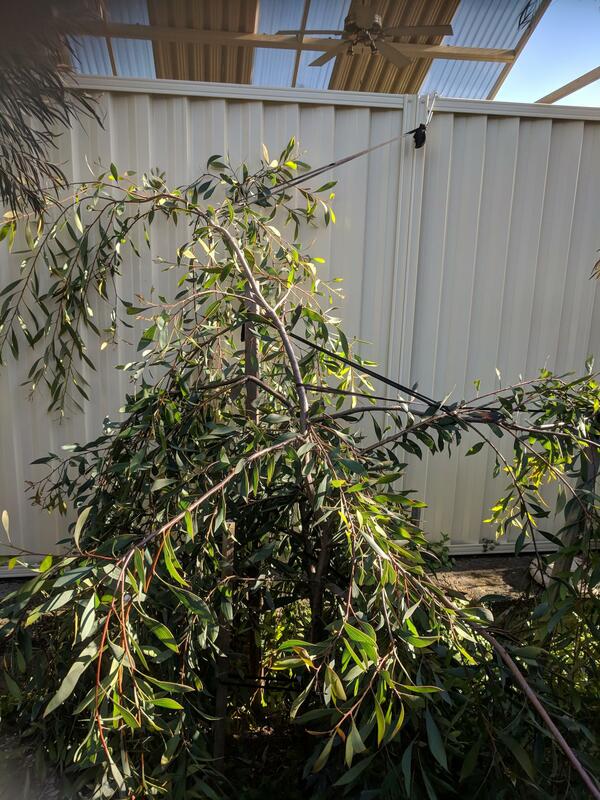 Hello, I have a Hakea that appears t be very healthy. However, its branches are typically droopy, and quite heavy. I have had to resort to holding it up with stakes etc to stop it falling over. Could someone let me know whether I should cut the long branches back, find another way of staking it or ??? I have attached a couple of photos, and any help would be appreciated. Thank you! Ideally when you buy a plant it should be able to be to stand without support. Your Hakea has lots of branches but a weak trunk. You need to do two things. Firstly prune the branches back to take some weight off the main stem. Second when you stake the tree make sure that there is enough room for the tree to sway in the wind. Your aim is to encourage the tree to stand on its own. A good option for staking is use hessian straps that pass around the trunk and attached back to the same stake, if you use three stakes in a triangle each about 30cm from the trunk the straps will support the trunk and allow it to sway and grow stronger. Pruning Acacia iteaphylla What is the best time & method of pruning Acacia iteaphylla? Can you help please. Tuckeroo fertiliser Does anyone know the best fertiliser for Cupaniopsis anacardioides - otherwise known as the Tuckeroo. I have 3 and want to give them a bit of up and go.